In today’s dynamic healthcare environment there are increasing pressures to manage to the double bottom line of delivering quality care with efficiency. In response to an increasing demand on dentists to manage both patient care and the business of dentistry, New York University’s College of Dentistry (NYU Dentistry) and its Stern School of Business have created a dual degree DDS/Master of Business Administration (MBA) program. Students can complete both degrees within five years with a flexible format that balances coursework with clinical practice. Students enrolled in the dual DDS/MBA program begin at NYU Dentistry on a full-time basis for the first two years. During the third calendar year, students take core MBA courses while continuing to hone their clinical skills eight hours a week at NYU Dentistry. During the fourth and fifth calendar years, NYU Dentistry remains their home as they take their remaining DDS and MBA courses within a flexible format that allows them to move clinical practice time when needed and take business courses when offered. NYU dental students in their second year may seek entry into the program. The GMAT/GRE requirement will be waived for the DDS/MBA applicants. The program will be limited to five students in its first year. Incoming or freshman NYU dental students who are interested in the program can email dental-ddsmba@nyu.edu for more information. 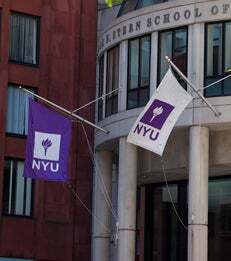 New York University Stern School of Business, located in the heart of Greenwich Village, is one of the nation’s premier management education schools and research centers. NYU Stern, whose faculty includes three Nobel Laureates in Economics, offers a broad portfolio of programs at the graduate and undergraduate levels, all of them enriched by the dynamism, energy and deep resources of one of the world’s business capitals. Follow NYU Stern on Twitter: @NYUStern.